Oh y'all, these are so wonderfully different and yummy! They were a big hit at my house this past weekend. 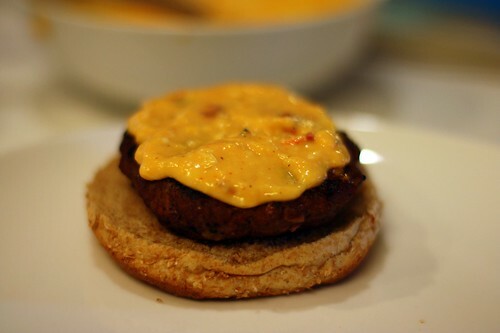 The homemade pimento cheese was really easy and added pizazz to regular burgers. Pizazz is always a good thing, no? Combine mayo, salt, pepper, and cayenne in a bowl. Stir in cheeses and roasted red peppers. Cover and refrigerate at least 30 minutes. Make your burgers and grill or cook them. 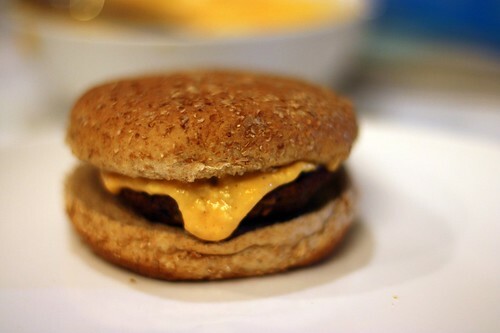 During the last 30 seconds of cooking, top each burger with cheese mixture, then cook covered until cheese melts slightly. Arrange burgers on buns and top with bacon. You should grate blocks of cheese instead of buying pre-shredded cheese. It makes a lot of difference in the creaminess of the texture. This is a Bobby Flay recipe. He was on TV with a Fouth of July special this weekend sponsored by Hellman's Mayonaise (our favorite) and he made these. I'm not involved with him or Hellman's, I'm just saying this is where the recipe came from. Keeping it FTC free all up in here. You really should try this at your next hamburger grilling. Check out the other Mouthwatering Moday posts! not really, but i did seriously consider it. You should! These are amazing,(and I'm not normally super big on pimento cheese). That looks and sounds fantastic! I swear I print whenever you post a recipe, they always look and sound so yummy! Hope you had a happy fourth of July. All the best. Oh Amy! I saw this recipe on the mayo jar and really wanted to make it. You luck dog! I can't wait to make them. ditto on the grate your own cheese. I am not a fan of pre-grated cheese. This ia an incredible recipe. I had the real thing at Flay's Bar Americain Restaurant in NYC this past week. Everything there is good. Grate your own cheese. I add a dash of vinegar and lemon pepper. Try it. O'h.... do not waste yout time with prepackaged premade pimento cheese. The real thing is so easy and taste 100% better than the grocery store stuff!! !